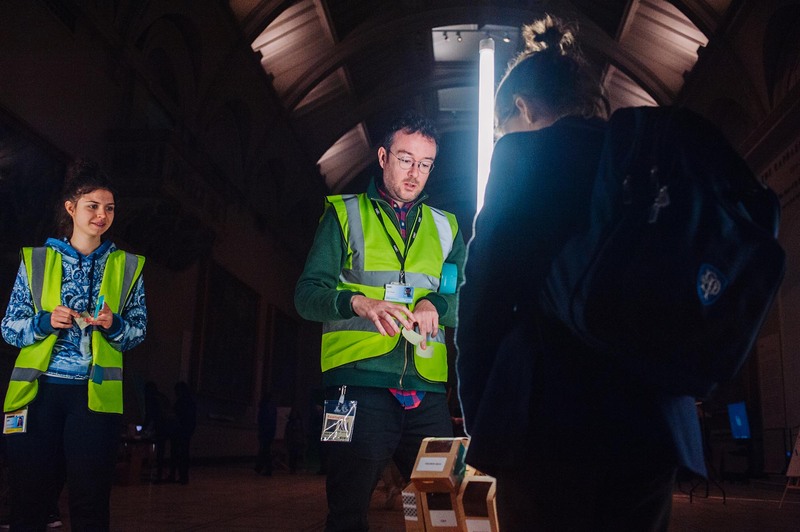 Last month, students from BA Interior and Spatial Design took part in a special event at London’s Victoria and Albert Museum (the V&A), aimed at introducing 13-19-year-olds to creative careers. Dominika Szemik and Wilson Aguirre Jaramillo, final year students, devised and ran an activity that invited visitors to contribute a building to a ‘floating city’ in the museum’s Raphael Court. The project expanded on themes they originally explored during a visit to Japan with the course in August. Part of Creative Quarter 2018 on 23 November, this day of free events on in South Kensington offered young people the chance to explore activities, talks and workshops run by cultural institutions that also included the Science Museum and the Natural History Museum. We spoke to Dominika and Wilson about the event, how their time in Japan inspired the workshop and what it was like introducing young people to their course which will be taught at Camberwell from October 2019. The activity you devised for the V&A had its roots in your experiences in Japan this summer. Can you tell us about that trip? Dominika: We visited Bunkyo Gakuin University (BGU), Tokyo for four weeks as part of a Summer School trip along with BA Graphic Design students from Camberwell. There we collaborated with psychology and social science students on a wayfinding project, designing workshops and products against the cultural background of the city. Wilson: We explored the local area while we were there, and were inspired by the apartments, architecture and the people in the city itself. The conversations we had there and the things we saw around us all went into the development of what we finally produced. D: We also worked closely with the technicians at BGU and were able to use all of their facilities, including their 3D printer, and used the project to combine technology and the traditional to make something new. How did your experience there help you to plan the activity for the V&A event? D: For us the key to this activity was inclusivity. It was important that the project was easy to assemble and accessible, so as to inspire creativity in the young people taking part. In Japan, we had a great collaboration with the students there, learning a lot from them about science and how to apply their kind of approach while we taught them about creativity and making/realising spatial experiences. This exchange of ideas is what we wanted to bring to the V&A activity. We knew what the space looked like at the V&A and wanted to use an aesthetic that would bring it to life. The Raphael Court is very classical and traditional looking, so we wanted to brighten it up and do something contemporary that would catch the eye of the young people at the event. W: We wanted it to look cool, but to keep it simple. So how did it go on the day? D: On the day we created an activity using traffic cones and simple, pre-made boxes which we invited people connect together to form a ‘floating city’. The boxes could be labelled with textures we had taken from the Raphael paintings in the room, as well as names denoting building functions from the UK and Japan – libraries, shops, houses, hospitals etc. We asked participants to add their own box to the growing city by thinking about where different buildings with different purposes should be placed, and what impact they would have on each other. For example, putting a bakery next to a gym – would someone come out after a work out and go straight in to eat a huge cake? W: It was a simple idea but having to consider how the functions worked next to each other and how the spaces related to each other was not always straightforward. The thinking and planning behind a city was more complex than it might first seem. The young people who took part were inspired by their own daily experiences and what they see around them – lots of them were keen to add chicken shops to their parts of the city! D: What emerged from the discussions we had with them was just how many variables there were. It showed them that cities are complex networks – something relatively simple actually invited lots of questions. There was a lot of humor too! Some people were deliberately provocative, placing things next to each other just to create a reaction. W: Young people are spontaneous and unpredictable so you don’t know what to expect. All of the young people who took part really took their time to think about their contributions and you could clearly see their thought processes as they decided what to place where. Is interactive or engaged work of this kind part of your usual practice? W: We have both taken part in Tate Exchange the past two years, when BA Interior and Spatial Design have been involved. For that we also worked with the public, with people of all ages. And I’m currently planning my next personal project – collaboration will definitely be part of it. I hope to be working across courses, with fine artists at Chelsea. This project was about getting young people to interact with Interior and Spatial Design – how did you get interested in the subject before you applied to the course? W: Since a young age I have loved making things. I wasn’t always sure what I wanted to do but as this course is very broad, it felt like a good fit. It’s about understanding the possibilities of design and the process you take to get to your outcome. That could be a product or an experience – designing for the home or creating a space in a hospital that encourages healing. D: I was always very creative and was initially interested in studying fine art but for me this course was a great combination of creativity and using research and data to guide what you are making. It was the applied nature of the course that attracted me to it. I was lucky to find it! When I first started thinking about applying for University, I wasn’t aware of all the fantastic art and design courses that were out there. 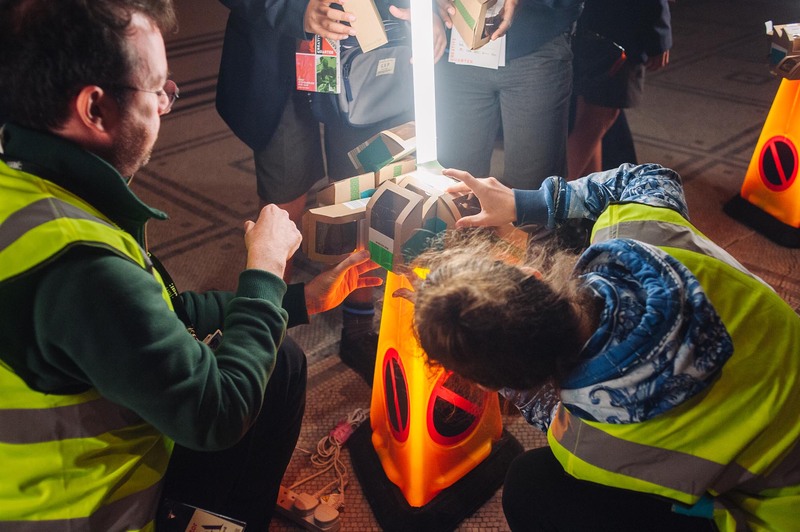 That’s why this project at the V&A was so useful – it will help the young people who took part to learn more about what variety of courses are available. One of the young people we spoke to at the event had been interested in studying medicine and through talking to us and course leader, Colin Priest, learnt about how principles of architectural design can and have been applied in medicine in things like developing artificial heart valves. For him, it was a totally new perspective. Find out more about BA Interior and Spatial Design on our course page.